My column in the newspaper is supposed to be 700 words, which means that I've learned to stop after 719—a fudge factor, I guess. I 'd never turn in a 720-word column, but find a word to take out. One of the drawbacks and benefits of print, the former because thoughts are lost, and the latter because concision is good: keeps the reader from being bored. In theory. Monday's mash-up of our trip to Virginia and Trump's trip to Helsinki was 1100 words when I wrote it and, rather than just pitch the 400 words that had to go, I kept them, here, where they form their own sort of mini-column. Names can deceive. We stopped in Hurricane, West Virginia for gas. You'd think the town would be pronounced "HURR-i-CANE." It's not; residents pronounce it "HURR-i-KINN." You'd think that it was named after a storm. It's not. No hurricane has ever gotten close. The town is named for the Hurricane Creek, which is named for a grove of trees that struck folks as windblown. Names can lead you astray. We drove six miles out of our way—three there, three back— gulled by a sign for "Tudor's Biscuit World." That name conjured up, for my wife, all variety of exotic biscuits. She envisioned sweet potato biscuits and corn biscuits, hot and airy, dripping with honey and butter. 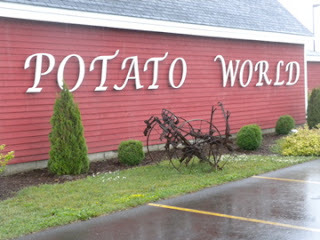 Our point of reference was "Potato World" in New Brunswick, Canada. We visited there with the boys on one of our tours through Canada, seven years ago. There was a fairly comprehensive potato museum, and a Hall of Recognition, and a dozen kinds of poutine in the cafe. I bought a "Potato World" t-shirt because, really, how often do you get the chance? Biscuit World turned out to be a fast food restaurant chain. Regular hamburgers and cheeseburgers, as well as sandwiches made of biscuits. We ordered coffee and a single $1.69, 495-calorie plain biscuit. Walking to the car, we decided that had to be a typo, or maybe me misunderstanding the board. Five hundred calories? For a plain biscuit? Then we took a taste of this dense, greasy disc the size of hockey puck, but heavier and thicker. Yup, 500 calories, easy. We each took one nibble apiece and threw the rest away without a second thought. Well, maybe I had one parting thought: it seems wrong to call these things "biscuits." Tudor's shouldn't be allowed, banned by some higher biscuit authority—the American Council of Biscuit Bakers, or some such thing. They should be forced to use another word, something vaguely vomity to pronounce—"blorbs," or another term with a trace of regurgitation to it. I'm telling you this: If I ever start a business, I'm making sure "World" is in the name. To draw in the dupes. Although a less-than-appealing name can work too. While hiking in the Shenandoah National Forest, we stayed two evenings at the Mimslyn Inn, an enormous 1931 brick edifice, half plantation house on a hill, half Grand Hotel. To be honest, I didn't give the name much thought, making the reservation. We had planned to stay at one of the lodges in the park, but the Yelp reviews were so passionately awful—mice, bugs, floods, all manner of horror—that it seemed prudent to try somewhere nearby. The Mimslyn Inn had nothing against it beyond an odd, awkward, hard-to-say moniker. Utter it aloud: "Mims-linn." Kinda discordant, is it not? Sitting in a rocking chair on its long porch, I knew where the "Mims" was from—the Mims family, which built the place and owned the hotel for the first 70 years. But why "lyn"? Where was that from? The town it is located in is called "Lury." I asked the man at the front desk. "That was just something to make it elegant," he said. "It was 'Mims Inn' for a while." I cherished the candor of his remark, it had a forthright sweetness, almost a sadness. Because while there was a residual stab at grandeur to the hotel, "elegant" it was not, not the tongue-twister of "Mimslyn," not the failure to get out coffee to breakfast patrons in a timely fashion, nor the silverware in the large dining room the cheapest stamped metal cutlery possible, a grade above plastic. Nor could my wife eat the trout they served. There wasn't a pen or pad of paper in the room, and despite its age, the walls were so thin, the TVs were set permanently at a whisper—something I've never seen in a hotel before anywhere in the world. You could see why; in the room at night, you could hear everything, down to the last drop being shaken off, from the bathroom next door. That's harsh, I know, so I rush to add that the staff was exceedingly nice and accommodating, happily condensing our two reservations into one, hurrying a salad to my wife to replace the inedible trout. The lobby is pretty, the rooms clean. They're doing what they can with what they've got, which is all any of us can do. I'd stay there again, if everyplace around was booked. Sorry about your disappointing biscuit experience. On the beach, in Ft. Myers Beach is a one off breakfast joint called Heavenly Biscuit. Fresh made biscuit sandwiches to order and homemade cinnamon rolls that you would never toss after one bite. If you can't stand the wait in line try Moms down the street, almost as good. I knew a woman named Mimslyn back in the day, about 25 years ago. I believe the name may have originated in England or Scotland. No idea what it means. And of course, everyone knew her as Mimsy. It's one of those affluent North Shore nicknames, like Bitsy and Mitzy (short for Margaret? ), or Buffy and Muffy. And then there's always Binky. In college, I knew someone named Muffet. She came from California, where they certainly do things differently. Nobody ever dared call her Muff...or even Muffy. She might have clocked them if they had. Open a smoothie shop and call it Whirled World. There's an Orange World near Disney World. It's a store from the 70s that...what else?...looks like a giant orange. There's also a Peach World in Georgia, along I-95. They sell a lot more than just peaches and peach pie (things like peach liquor and sword canes). And Massachusetts has extremely high taxes on alcohol, so folks up there cross the line into New Hampshire--to shop at...wait for it...Booze World.